I hope you had a great sunday so far. We went to "Sealife" with some friends today and the kids had a ball :) It is also the birthday of my beloved husband, so I won't be online long ;) I nevertheless wanted to take the chance to announce the lucky winner of the free Whiff of Joy / Elisabeth Bell Spring Stamp Kit, which can only be ordered until tomorrow. Thanks to all of you who took part and helped spreading the word about it!! Ich hoffe ihr hattet einen schönen Sonntag. Wir waren heute in "Sealife" in Konstanz und die Kinder hatten einen riesen Spaß. Ausserdem ist heute auch der Geburtstag von meinem lieben Mann, deswegen werde ich nicht lange online sein ;) Trotzdem möchte ich gerne die Gewinnerin des Whiff of Joy / Elisabeth Bell Spring Stamp Kits verkünden. Das Kit könnt ihr noch bis morgen 24:00 vorbestellen. Danke an alle, die mitgeholfen haben die Neuigkeit von dem Kit zu verbreiten!! I don't want to let you wait any longer. 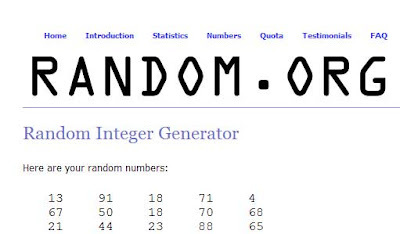 Random.org picked number 13 as the lucky winner. Tara from Inking on the Edge -- congratulations!!! I will ship your kit together with the others as soon as they are ready. Ich möchte euch nicht länger auf die Folter spannen. Random.org hat Nummer 13 als Glückszahl ausgesucht. Tara from Inking on the Edge -- Herzlichen Glückwunsch!!! Ich werde dein Kit zusamment mit den anderen schicken, sobald sie verfügbar sind. Good night everybody and have a good start of the week tomorrow!! Wow! Tara....BIG, BIG CONGRATS!!! U R absolutely the lucky, lucky winner alright!!! Can you post a picture of the items you won? Puhleeese! I know that for sure I want to see as well as the other bloggers too! Thanks so much, Katharina!!!! I am so thrilled and I will definitely post a pic of my stamps when they arrive!!! I guess #13 is my lucky number,smile!!!! You made my day!!! Thanks again!!! Congrats, hope you'll like the stamps. Yaaaaaaaaaay for Tara!! I know she will do fabulous things with the new stamps!! Congrats, girl! !